Key Difference: Monkeys are primates that belong to the Haplorhini suborder and Simiiformes infraorder. Gorillas belong to the Hominidae family and Gorilla Genus. Gorillas are considered as the largest primates by physical size. Monkeys have a long tail that can be used to balance, while Gorillas do not have a tail. Kids and adults alike, often confuse a monkey and gorilla. For kids, something that looks similar to monkey is also going to be a monkey, as it is a more commonly used term. However, monkeys and gorillas are quite different to each other. Although, both are mammals and can be classified as primates, the similarities end there. Gorillas are actually more similar to humans than they are to monkeys. Monkeys are primates that belong to the Haplorhini suborder and Simiiformes infraorder. Monkeys can be divided into two groups: Old World monkeys and New World monkeys, excluding apes and humans. 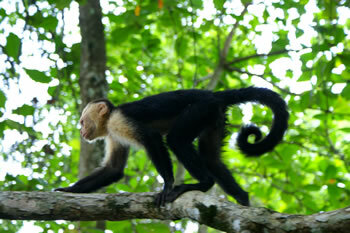 There are more 260 living species of monkeys, many of which are arboreal. Although initially, monkeys were considered to be synonyms and used interchangeably, in the first half of the 20th century, it became clear that apes and monkeys had a lot of differences between them. Monkeys can range in size with the smallest being 4.6 inches with a 6.8 inches tail, weighing 100 grams to 3.3 feet weighing 36 kilograms. While, many of the monkeys are arboreal, meaning they reside in trees, there are species that reside on the ground in savannahs. Monkeys have small arms and long legs and opposable thumbs on both their hands and legs, and contrary to popular belief monkeys do not swing as their arms are weak. They are more prone to running on branches and climbing to the top of the treetops. Monkeys have a long tail that can be used to balance. They also communicate via expressions, vocalizations and body movements. They show affection and make peace by grooming each other. Monkeys posses a smaller brain and have a diet of fruits, vegetables and small insects. Gorillas belong to the Hominidae family and Gorilla Genus. Gorillas are considered as the largest primates by physical size. 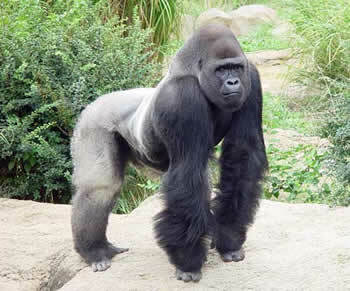 The gorilla species are often considered as distant cousins to the humans and are believed to have the same ancestry. There are two dominant species of gorillas, with two subspecies each. There has been a new subspecies determine, but it has not yet been added to the existing official database. The Western Gorilla has the subspecies Western lowland gorilla and Cross River gorilla, while the Eastern Gorilla has the subspecies Mountain gorilla and the eastern gorilla. Gorillas are bigger in size and have long and strong arms. The arms are often longer than the legs. Gorillas move on their feet and knuckles, meaning they are quadrupeds but on many occasions they can stand upright and walk bipedally for short distances when they are carrying food or are in defensive situations. Female gorillas are smaller compared to the male gorillas and usually weigh half the size of the male. Gorillas can weigh around 180 kilograms and can even go up to 270 kilograms in captivity. The male gorillas are often known as silverbacks, because of their silver hair that extends from their back to their hips. The eastern gorilla is more darkly colored than the western gorilla, with the mountain gorilla being the darkest of all. Gorillas mostly live on the ground, with many creating nests on ground near trees. Gorillas spend much of their day foraging, traveling and resting. Mountain gorillas mostly eat foliage, such as leaves, stems, pith, and shoots, while fruit makes up a very small part of their diets. Eastern lowland gorillas have a more diverse diet, made up of leaves, shoots, fruits and even insects such as termites. Gorillas can be told apart from monkeys in that they do not have a tail. They travel in groups known as troops. A troop is made up of a silverback, multiple female gorillas and their offsprings. There are also troops, where multiple males exist. Western gorilla and eastern gorilla with either four or five subspecies. Longer, usually upright posture. Long and strong arms for swinging from branches .